"Alternet", "Barack Obama", "Professional Left"
Jim Sleeper at Alternet published an article the other day that is a collection of bizarre thoughts about why the President's "Lefty" critics should be immune to counterattacks while they continue their unabated, sometimes-racist, almost-always reality devoid bashing of President Obama. If there are two words that sum up the sentiment Sleeper expressed, those words are: thin skin. Sleeper, as his whiny Left cohorts, goes nowhere close to debating Barack Obama's presidency on the policies and the merits; rather, he chooses to defend the likes of Drew Westen, whose article last month in the New York Times basically called the President a coward. My argument here isn't that the Obama apologists I'm knocking -- Jonathan Chait, Fareed Zakaria, others -- should abandon him, even though he's abandoned a lot of what most Democrats think he promised to fight for. My argument, rather, is that his defenders should stop trying to discredit sharp critics of Obama, like Drew Westen, who've shown what kind of leadership the President still can and must exercise as a strategist and, yes, as a story-teller, the latter role being far more essential to good politics than some Beltway "realists" understand. Evidently, Jim Sleeper has a pulse on "most Democrats" that he has made out of whole cloth. Democratic support for the President is persistently high, and he scores the greatest support among self-identified liberal Democrats. In addition, he is whining that progressive supporters of the President - who according to any given opinion poll represent the vast majority of progressives in the country (including at the Professional Bashers' favorite gathering place, Netroots Nation) - should just STFU about the unjust vilification of the President that we witness every day. The detractors ought to be allowed their destructive dialogue, but the supporters of President Obama need to be silenced. Well, tough, Jim Sleeper. We're not going away, and we are not leaving you alone. To also see how far the long arm of arrogance at the tip of a pen can extend, notice Sleeper's comment that President Obama must learn "story-telling" from Drew Weston. Yes, the man who captivated the imagination of a nation with his story needs to learn from the elitists on the Left how to tell a story. And if he would just tell the story properly, i.e. just the way the whiners want him to, then the Republican opposition in Congress would evaporate, the right wing nut job talk show hosts would stop aiming for the president to fail, and a liberal utopia would be ushered in with rainbows and ponies. Soon enough, though, Sleeper gives away the house of cards his defense of the Professional Left is based on: they operate based on a different set of facts than those of us who he derides as 'realists' do. We have here a number of disagreements, not just about the facts of the crisis but about which facts matter most - which premises, rules, and practices should govern a post-national, yet still national, world. That's the problem, right there. You cannot have a disagreement "about the facts." Facts are facts. You can have a disagreement about which facts you think are important and so on and so forth, but facts are facts. The facts of the economic crisis are simple (though hardly easy): massive deregulation of banking and financial sectors took place over 30 years coupled with lax oversight, and what followed was a financial catastrophe of proportions not seen since the Great Depression. I don't know what Sleeper's disagreements about those facts are. But of course, there are several things gets completely wrong on the facts; not surprising for a piece that is premised on the idea that different people can disagree on what the facts are. It's true enough, as Zakaria says, that if the U.S. cracks down too harshly on big banks, they'll just leave for Switzerland and other countries. But has he or anyone explained why we wouldn't be better off if they did leave? Maybe [Obama] believes that while American banks need better regulations, America also needs a vibrant banking system and that, in a globalized economy, constraining American banks alone will only ensure that the world's largest global financial institutions will be British, German, Swiss and Chinese. This refers to two things: first, the need for global regulations of financial institutions. Which, by the way, the Obama administration has lead on successfully with the BASEL III recommendations coming out of Switzerland. Second, it refers to the idea that regulating American banks (and financial institutions) alone is not the whole solution to the problem. Zakaria's point isn't what would happen if the institutions leave. His point is that were these institutions to move off shore, they would be able to cause the exact same kind of havoc in the United States without being subject to a lot of US laws regulating large financial institutions. In other words, the liberal goal of a better regulated financial system is not completely achievable without some global rules of the road. Lastly on this point, it is preposterous to insinuate that this President or this administration has ever had any qualms about cracking down on big banks within the law. Not only did they pass Dodd-Frank, the most significant financial regulatory reform since the Great Depression, and the reforms included the nation's first ever consumer protection agency along with massive expansion of regulatory authority that allows regulators to dismantle a bank if it poses a risk to the greater economy. The Administration blocked executive extravaganza for banks that had to be bailed out at taxpayer expense. And just lately we have learned that the Obama Administration is preparing lawsuits against a dozen big banks over mortgages. It's also true, as I reported Zakaria saying in my last post, that millions of the manufacturing and even service jobs once done by Americans can be done now by more workers abroad. But many American manufacturers have outsourced jobs and/or closed plants that were doing fine with a 15% rate of profit until their new, publicly traded conglomerate owners demanded a 22% rate of return. By what God given or natural right? By no right besides a long train of decisions by the corporate bought-and-paid for Congress or the courts and by global market pressures that no polity is supposed to challenge. That Obama won't say this is Westen's point. That Obama won't say it? Say it? If Obama just said the obvious that conglomerates could do with a lower profit margin, everything would magically change and we would start seeing all the jobs being brought back? What's the freaking point here? Does Sleeper think that given the shameless outsourcing of companies, Obama should try to shame them? If that's it, then he (Sleeper) is the naive one. Or should the president try pursuing a profit cap? I'm sure that will go over well in Congress. Yeah, I know, that damn realist in me. Wouldn't we be better off paying attention to what the President is doing rather than whining about what he "won't say?" Let's talk manufacturing. Here's a president that single-handedly rescued the American auto industry and saved a million manufacturing jobs. But hey, he didn't say that conglomerates don't have a "God given right" to make 22% profit. So all bets are off. What. The. And that's the crux of Sleeper's piece. There are no real policy points in his piece (see above about facts being stubborn things). It's all a gigantic whine-piece about the Professional Left not being able dictate the President's rhetoric. But that's okay. As long as you are finding ways - even if you are gasping for straws - to whine and moan about the President, you are a-ok. But don't you dare take on these high-horse whiners. Then they become big crybabies: Wuaaa! Stop being mean to us! We're the kool kids! Only we get to be mean to other people!!!! 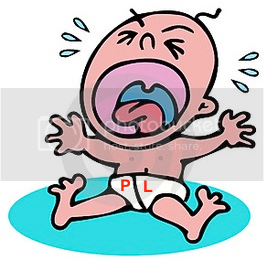 The 'rhetoric' crybabies are even worse than the 'pony' crybabies. At least when the Professional Left was whining about the public option and telling us that we should destroy health reform if we couldn't get that, or when they were crying for the nationalization of the banks, they looked like they were trying to be relevant to policy. But not anymore. Now it's about punditry on how the president says things. Presidential rhetoric experts one and all, I guess. Sometimes, the whiners pretend that their demands of podium pounding (and their recently-found love for presidential poetry) had a policy end. Now, the pounding of the podium itself is the end. Be that as it may, let me declare that the immunity season for the Professional Left is over. The pragmatic progressive blogosphere is here, and we will continue to challenge the establishment professional opinionators. No, Jim Sleeper, the President's constant detractors will not be left alone.